It seems only fitting that the idea for our ‘Around the World in 117 Dishes’ challenge was born during an evening meal that felt like it included 117 dishes. On Friday night, we spent four and a half fabulous hours at a new restaurant in Addiscombe called Alchemist. Technically, there were only twenty courses in our ‘Arabian banquet’, but by the time we rolled out the door at 12:30 we’d pretty much lost count. As well as munching our way through hummus, tzatziki, dolmades, devilled mussels, tagines, cous cous, ice cream and fruit (just to name a few), four and a half hours also allowed plenty of time for chewing the cud, and the seed of the challenge was planted: we would aim to cook our way around the world, making a meal from each country we ‘landed in’ along the way. The next couple of days involved poring over Google Maps (sadly, in this age of technology my atlas lay untouched on its shelf) and finally, a Blockbuster-style route around the world, taking in as many countries as possible (117), was created. Our first idea, which seemed logical at the time, was to start with England, but given that yesterday was St David’s Day, and Wales made better geographical sense, we began researching the best way to make a traditional Welsh cawl (lamb stew to you and me) in preparation for our Sunday dinner. A dish involving both lamb and leeks seemed the best way to honour Wales at the commencement of our culinary journey. 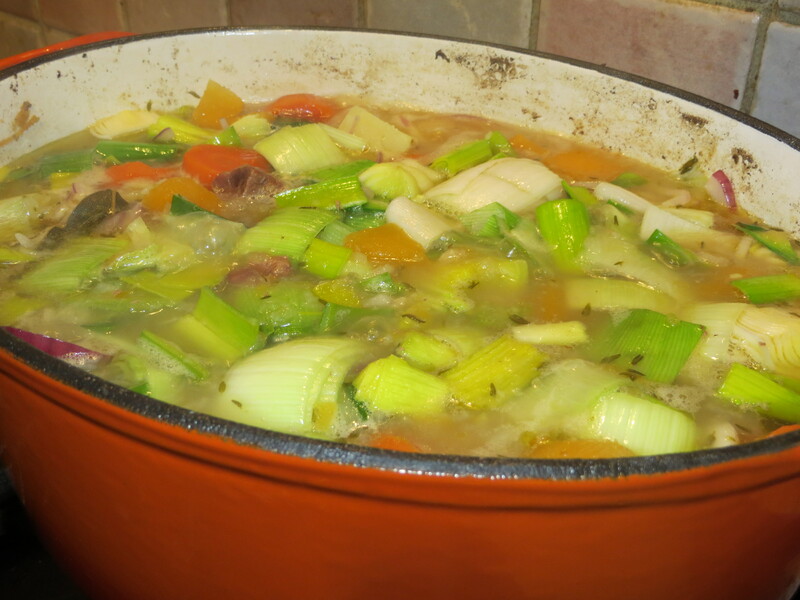 It would seem that the area of Wales you are in determines exactly what goes into a cawl, but that the common elements are lamb, swede, carrots, potatoes and leeks, simmered for a few hours. It’s apparently ideally served the day after it’s cooked, but given that we didn’t start cooking it until 4pm on Sunday, we unfortunately had to sacrifice that element. It’s for a good reason though: we couldn’t face the thought of food on Saturday after Friday night’s gluttony, and we spent half the day on Sunday trekking for miles in order to track down a particular variety of chilli sauce. So, the cawl. I don’t think either of us would rate it as our favourite meal ever, but as Ash put it, you could feed an army for very little money with the great big pot of it that we made, and that is really what it’s there for. It was certainly a hearty, tasty meal. 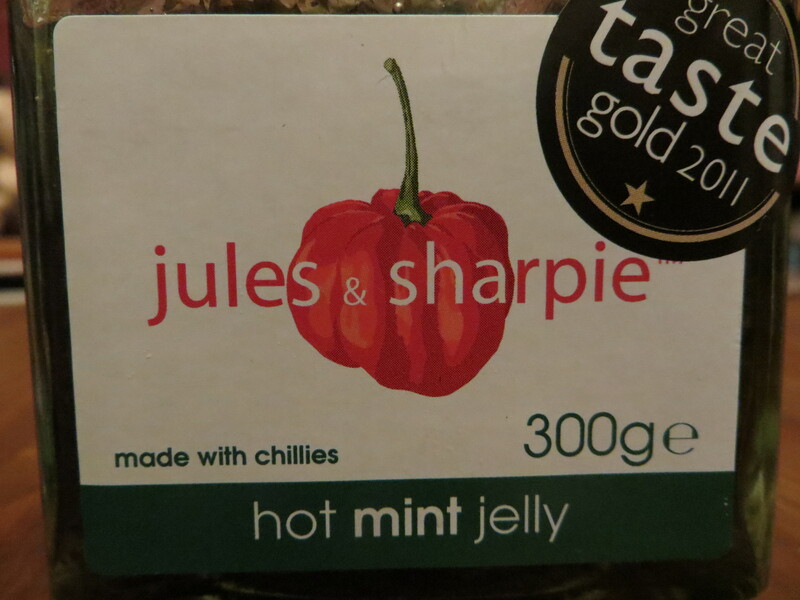 However, by nature, it’s fairly bland, so we’d like to give a shout out to Jules & Sharpie, whose award-winning hot mint jelly really gave the cawl the kick we both love. The recipe was inspired by one found on Earthy, varied only slightly because we didn’t have exactly the right ingredients. This really doesn’t matter as there are so many different versions of this meal out there, and you could easily increase the ingredients you do like and decrease those you don’t. Pearl barley seems to be an unusual addition, but we were keen to include it to add that bit of extra heartiness on a miserable wintry night. 1. Trim and dice the meat and put into a deep pan with plenty of water. Bring to the boil slowly and skim. 2. Add the pearl barley, carrot, brown onions and swede. Bring back to the boil and season with salt and the 10 peppercorns (though we think more of them would have brought more flavour), as well as the thyme and bay leaf, and simmer gently for two hours. 3. Add the potatoes and simmer for 20 minutes. 4. Add the leeks and red onion and simmer for a further 5-10 minutes. Perfect with a glass of red wine and torrential rain coming down outside. You may wish to add some crusty bread to mop up the juices, but a spoon is also sufficient. 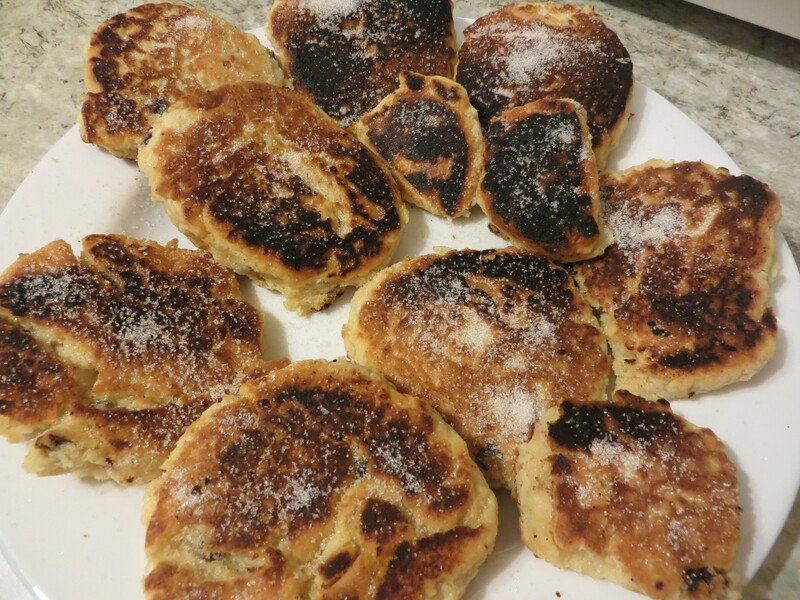 And of course, we couldn’t finish our Welsh meal without some freshly made Welsh cakes and a cup of tea, with many thanks to the Hairy Bikers and the recipe from their Mums Still Know Best book. 1. Sift the flour into a bowl and add the diced butter, and rub together until it resembles breadcrumbs. 2. Add the sugar, sultanas and egg and mix well to form a ball of dough, using a splash of milk if needed. 3. Roll the dough out to a thickness of approximately 5mm and cut with a 7-10cm round. 4. Rub a cast iron flat pan with butter and place on the hob until it is heated through. Very important! We didn’t heat the pan enough and it nearly ended in disaster (as you can see by the slightly burnt bits in the photo). 5. Cook the Welsh cakes for 2-3 minutes each side until golden brown and sprinkle with a little more caster sugar whilst still hot. 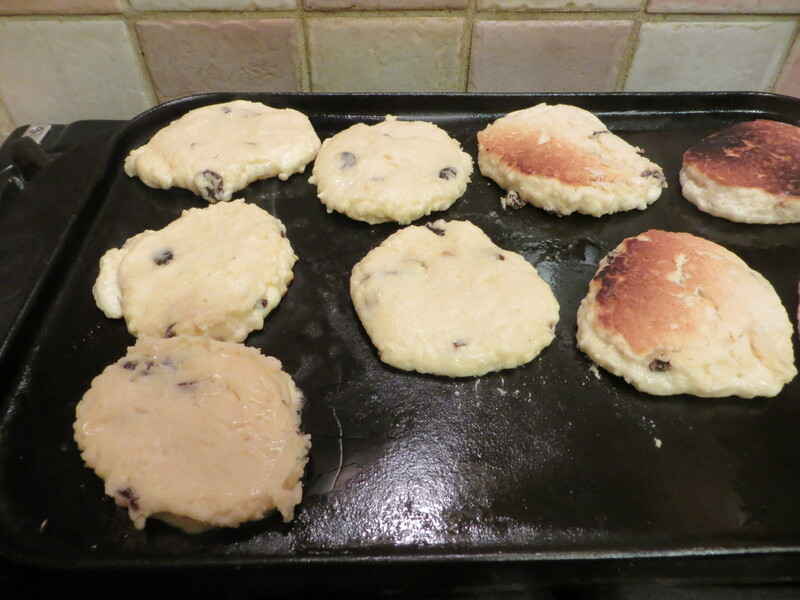 This entry was posted in Cooking, Dessert, Dinner, Food and tagged cawl, Wales, Welsh cakes by mash29. Bookmark the permalink. PS Thank you for being our first commenter! Yum! I’m sitting here eating them right now. I’ll send you a pic of the evidence. Thanks for the recipe! Also, I don’t think your plates are bad at all! It’s probably too late to change the title of the blog to “Good Food on Perfectly Fine Plates”, though. Welsh cakes! My absolute favourite. We’re over the Bridge in Bristol and they’re definitely a staple in these parts too! I love them too. Revisiting this post has reminded me that I need to make them again!